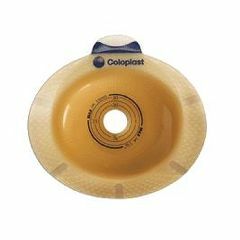 Convex Light SenSura Click Standard Wear Barrier with Belt Tabs provide shallow convexity for flush or slightly retracted stomas, providing flexibility, security and low pressure to the abdomen. SenSura offers a double-layered adhesive designed to meet five core needs. The lower layer provides absorption and moisture balance while the upper layer is erosion resistant. The new adhesive formulation also offers optimal adhesion flexibility and ease of removal. For optimal wear time, warm the adhesive between your hands and then against your body before applying.